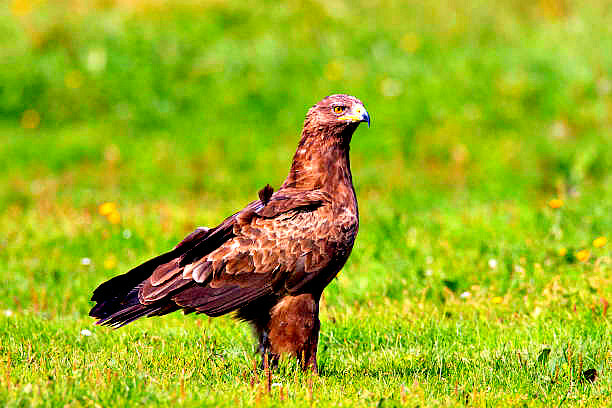 The lesser spotted eagle is a medium-sized bird of prey with dark brown plumage, broad wings and a small bill. While there can be significant variation between the brown plumage tones exhibited by different individuals, the head, neck and upperwing coverts are generally paler than the body, and the flight feathers are usually particularly dark. In most specimens, but especially noticeable in younger adults, there is also a white patch on the upperwings that can be seen during flight. In contrast to the brown plumage, the eyes, feet and the skin at the base of the beak are yellow. The juvenile is darker than the adult, with a rufous-yellow patch on the nape, spots on the upperwing coverts, and white tips on tail and the trailing edge of the wing.